Download Exchange Database repair tools because it is best exchange email recovery tool to repair exchange database and also restore Exchange database to PST. Exchange database repair software greatly repair EDB file to PST file with all respective folders- inbox, sent items, drafts, deleted items folders plus journals, notes, schedules, tasks etc. Through Exchange database recovery you can recover single selected Exchange emails into every formats- EML, MSG, HTML or PST within few moments. Exchange repair tools provides the simple process to repair corrupted EDB file and export EDB file data into new healthy Outlook PST file. EDB recovery tool easily supports all versions of EDB file- 5.0, 5.5, 2000, 2003, 2007, 2010, 2013. * Effectively repair Priv1.edb file and export user mailboxes with their respective emails and other items. 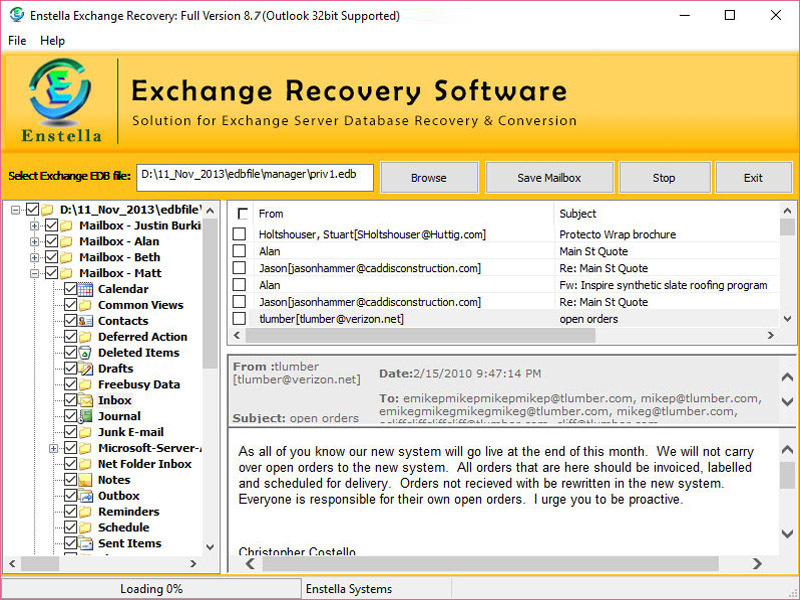 * With demo easily restore 25 emails to every format at free of cost but to restore EDB to PST download full version of Enstella Exchange Database Repair Tools.